This officially licensed NCAA auto emblem is the classy way to show off your favourite team! They look great on all vehicles or any hard surface (RVs computers refrigerators etc). Includes easy to apply instructions. Made out of durable chrome plated solid metal. The emblem is embossed and printed on chrome for a dynamic look. Measures approximately 2 5/8 inches x 3 inches x 1/8 inches thick. 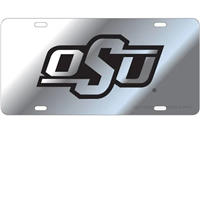 Officially licensed - Oklahoma State University Pistol Pete shiny chrome auto emblem by Elektroplate. All-metal (NOT plastic) with a shiny chrome finish, Made in the USA. Attaches via paint-safe 3M adhesive foam tape. All Elektroplate car emblems are comprised of a chrome-plated metal finish made to withstand harsh outdoor conditions. This auto emblem will look brand new for years to come (as opposed to cheap imitations that will fade or chip within months of being on your vehicle). Our high-end auto emblems are the perfect way to showcase your school pride everywhere you drive. In addition, all Elektroplate chrome emblems are packaged in elegant retail packaging to make a great gift! 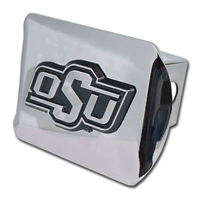 Celebrate your Oklahoma State Cowboys fandom with this Metal Helmet domed auto emblem! 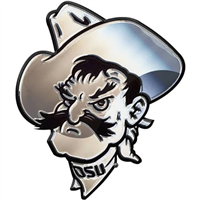 This helmet-shaped emblem features domed Oklahoma State Cowboys graphics on the helmet and chrome accents. 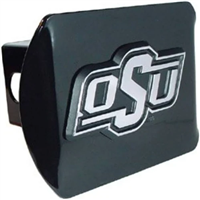 This is the perfect way to add some Oklahoma State Cowboys spirit to your car in a bold new way that will really make your love for your team stand out! 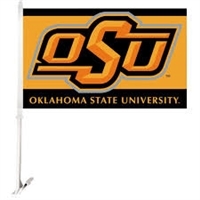 Get one for every Oklahoma State Cowboys fan you know! Made on a black metal plate with high quality outdoor grade mirrored chrome vinyl. The logo is very reflective - just like looking in a mirror! Show your team spirit with this vanity plate!